Rameshwaram is an island situated on the tip of the Indian peninsula. The city is also an important south India pilgrimage center of the Indians. It is the place from where Lord Rama had built a bridge across the sea to rescue his consort Sita.This is the place where Rama worshipped Lord Shiva to cleanse away the sin of Ravana. Both the Vaishnavites and Shaivites visit this pilgrimage city. Rameshwaram is significant for the Hindus. The presiding deity is the Linga Of Sri Ranganatha, which happens to be one of the twelve Jyotirlingas of India. Rameshwaram is popularly referred as the 'Benaras of the south'. In order to attain Moksha it is believed that a visit to Rameshwaram is mandatory. 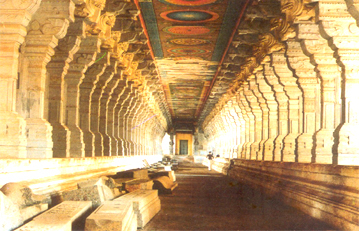 In fact the entire area of Rameshwaram is associated with various incidents from the Ramayana. The city of Rameshwaram happens to be one of the most visited pilgrim sites in India. The places of visit include the Ramanathaswamy Temple, which was built in the 17th century and is situated close to the sea on the eastern side of the island; this temple is famous for its 1200 gigantic granite columns. At a distance of about 100 metres comes the Agnitheertham, where Rama worshipped Lord Shiva, to absolve himself from the killing Ravana.Another shrine called Gandamadana Parvatham is worth visiting. This shrine is found at 2kms away from Rameshwaram. A place called Dhanushkodi named after Rama's bow is at the eastern end of the island at a distance of 8 kms from Rameshwaram. Pamban bridge is 3 kms long which connects the island of Rameshwaram & Dhanuskodi to the mainland. This is the longest bridge in India and illustrates the marvel of the engineers. The bridge allowed meter gauge trains to run over it since 1911. The Department of Railways has planned to run broad guage trains over it and the works are going on. One can have a beautiful view of the sea while crossing through this bridge. This is the easternmost tip of Rameshwaram. Most of this spot is occupied by the sea during tropical cyclones. On the way, the Kodandarama temple exists. The nearby places Tiruppullaani & Devipatnam also have legends associated with Ramayana. Economic Package Tours Available, Laxury Cars A/c, Non A/c Available. . . .
Economic Price compared to other Travel Agents. . . . .
Will pick you from Airport / Railwaystation.